An artist's illustration of an asteroid breaking apart in space. The dust on the surfaces of small asteroids is a result of extreme temperature shifts between periods of sunlight and darkness — a cycle of drastic changes that break up space rocks over time, scientists say. Asteroids rotate like the Earth does, creating temperature fluctuations as their sides change from day to night, the researchers explained in a new study. On the smaller surfaces, these changes can be sufficient to crack and break apart the outer edges of the rocky bodies. Delbo was the lead author of an experiment and subsequent model that determined these temperature changes were responsible for wearing away small asteroids. As tiny bits of rock known as meteoroids collide with the moon and other rocky bodies in space, they create a layer of dust known as regolith across the surface that's perfect for capturing astronaut footprints, among other things. Dust from the collision flies into the air, but the moon's gravity is strong enough to draw it back to the surface. Regolith similarly dominates larger asteroids, which are also capable of retaining their dust. But rocky bodies a kilometer wide or smaller have a problem: Their gravity isn't strong enough to hold on to most of the dust created in a collision. Previously, this wasn't a problem; astronomers simply assumed that such asteroids were devoid of regolith. But recent space missions, such as NASA's NEAR-Shoemaker visit to the asteroid Eros and Japan's Hayabusa mission to the Itokawa, revealed the presence of regolith on even smaller asteroids, raising questions about its formation. To determine how the particles formed, Delbo and a team of scientists performed laboratory experiments on two types of meteorites — a carbonaceous chondrite sample from Australia known as the Murchison meteorite, and an ordinary chondrite from the Sahara, both considered the closest available analogs to their type. "Meteorites are the best sample of asteroids we have on Earth," Delbo said. As meteorites rotate over the course of their day, the changing temperatures create stresses on the rock that expand existing cracks in the surface. "Cracks are always present in any natural material as little defects of the structure," Delbo told Space.com via email. "They can be very small sometimes — a fraction of a micron." To test their theory, Delbo and his team put the meteorite samples into a climate chamber, where they were subjected to the day-night temperature variations experienced on the surface of near-Earth asteroids. In just more than 400 cycles, the scientists observed an increase in the length and width of several pre-existing cracks in the surface of both meteorites. The erosion had a stronger effect on the softer Murchison meteorite sample, which the team proposes would explain the shortage of similar carbonaceous meteorites in space. Based on their experiments, the researchers concluded that thermal cycling breaks down asteroids at about 1 astronomical unit (AU) from the sun at least 10 times faster than micrometeorites do. 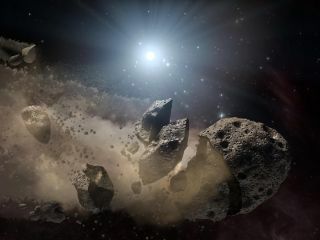 The softer carbonaceous asteroids suffer an even faster death; a 10-centimeter (4 inches) boulder should wear away in less than 1,000 years, compared to the 10 million years it would take for micrometeoroids to destroy it, the team said. The results were published online today (April 2) in the journal Nature, along with a commentary article by Heather Viles of the University of Oxford. Small meteorite samples weren't enough. The scientists wanted to investigate the effects of thermal fragmentation over different cycle periods, as well as determine if such effects would break a larger asteroid apart. They created a model of thermal cracking to explore various scenarios. "The collaboration with K.T. Ramesh's group was amazing," Delbo said, speaking of his co-author from Johns Hopkins University in Maryland. The independently developed model matched up with the experiments. "This also gave us confidence in our results," Delbo said. The model revealed that an asteroid orbiting the sun at 1 AU — the distance from Earth to the sun, about 93 million miles (150 million kilometers) — would see its centimeter-size fragments break up an order of magnitude faster due to thermal fragmentation than by micrometeoroids. Because the temperature fluctuations grow smaller at farther distances from the sun, thermal fragmentation continues to dominate out to about 3 AU. At 2.5 AU from the sun, the main asteroid belt, which lies between Mars and Jupiter, falls in the region where thermal fragmentation continues to dominate. As a result, asteroids with orbits closer to the sun should contain more regolith on their surface. The rapid rate of destruction caused by the temperature fluctuations means that a 100-meter (328 feet) object orbiting at 0.3 AU would completely erode over roughly 2,000 years. At the same time, a smaller 1-cm (2.5 inches) object would take micrometeroids several million years to break apart. The shorter asteroid lifetimes predicted by the model should mean that there is a smaller population of small asteroids in orbit near Earth today than there would be if impacts were the dominant method of forming regolith. "Diurnal temperature cycling has previously been neglected as a potential contributor to surface modification and regolith production on asteroids," Viles wrote. "It should now be considered alongside other processes of space weathering." Delbo and his team plan to continue investigating how asteroids degrade due to higher temperature changes that would result from closer solar orbits, as well as explore which minerals feel a stronger effect from the fluctuations. They will also study how the distribution of regolith is affected on small near-Earth asteroids such as 101955 Bennu, the target of NASA's OSIRIS-REx asteroid mission. Slated to launch in September 2016 and encounter Bennu in October 2018, the spacecraft will spend a year mapping the asteroid before it returns to Earth with a surface sample that includes regolith. "OSIRIS-REx will give important hints about how thermal fatigue works on carbonaceous asteroids, we hope," Delbo said.